Striker Andre Gray confirmed that he won't shy away from his responsibility as the club's chief penalty taker while admitting that he won't try to emulate Barcelona's Lionel Messi either. The Championship's leading scorer was denied his 19th goal of the campaign at the weekend when foiled from the spot by Reading stopper Ali Al Habsi in the goal-less draw at the Madejski Stadium. Prior to the penalty being taken the 24-year-old was hounded by the Omani international, who had conceded the foul, before defender Jake Cooper kicked the ball away and Hal Robson-Kanu scuffed the penalty spot. However, Gray refused to use the gamesmanship of the Royals as an excuse for failing to find the net from 12 yards. "I had a couple of chances on Saturday but it wasn’t my day but hopefully I can put things right this weekend," he said. "It didn't get in to my head at all. I knew which way I wanted to go but the keeper has made a good save. Penalties are penalties, sometimes you miss and sometimes you score. "They can do what they want. It didn't phase me at all and that's not the reason I missed the penalty. “If that’s how they feel they want to be that’s up to them. We don't do that here. If that's how they want to be then so be it. "The best players in the world miss penalties. I’ll take the next one if it’s my turn and try to score that one." The following day one of the greatest players on the planet did technically miss a penalty, though Messi intentionally set the ball up for team-mate Luis Suarez to net his hat-trick in a 5-1 win over Celta Vigo at the Nou Camp. 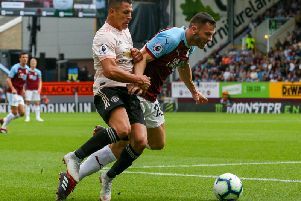 While many believe the 'pass penalty' was fashioned by Johan Cruyff in 1982, it actually emerged decades earlier and it was Burnley legend Jimmy McIlroy that was part of it. On May 1st, 1957, McIlroy combined with Spurs great Danny Blanchflower as Northern Ireland took on Portugal. “I don’t think the gaffer would be too happy if we did that," said Gray. “I don’t think it’s disrespectful. I think it’s part of of the game. It’s like taking a short free kick or whatever, it’s just the way the game is played. “It’s not illegal so I don’t see it as disrespectful. “I think if Messi goes and dinks the keeper they’re going to say that’s disrespectful as well so it’s not different to that. “The FA or whoever made the rules haven’t changed it. Players will do what they have to do to score."